With more than a million units installed over the past 20 years, Shakespeare composite crossarms and deadend structures are increasingly the preferred choice on new installations and for the replacement of aging infrastructure on power transmission and distribution infrastructure. 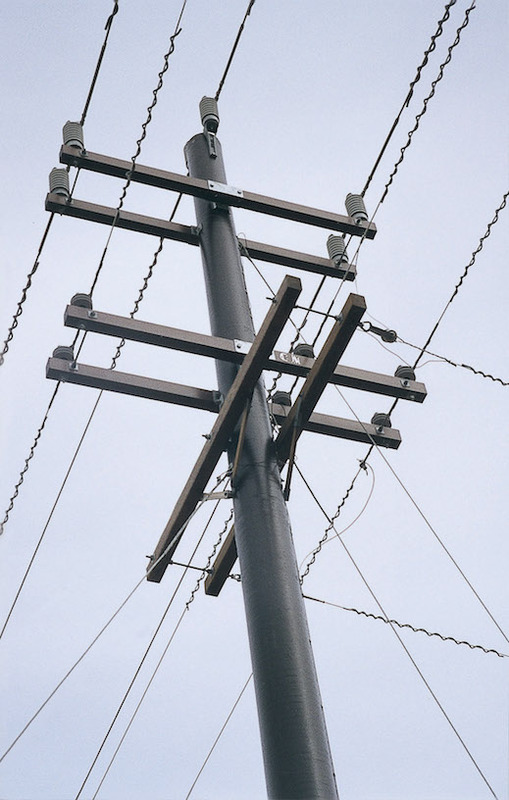 Shakespeare composite tangent crossarms and deadend structures can be installed with ease, on any utility pole, whether the pole is a wood, steel, concrete, aluminum, or composite material. Possessing a high strength-to-weight ratio, Shakespeare composite structures are an ideal choice for power distribution and power transmission tangent crossarms, the horizontal beams which support power lines. In fact, Shakespeare offers the widest selection of composite crossarms in the industry with length up to 40’ in six different profiles from 3.5” x 4.5” to 4” x 7.5”. Our Shakespeare crossarms are now better than ever with the addition of the matrix insert. This durable insert improves torque performance and provides unprecedented crush resistance for insulator angle turns and field drilling. The Matrix Insert is now provided in all S-Series crossarms and may be available upon request for profiles and assemblies. To learn more about Shakespeare composite tangent crossarms or Shakespeare composite deadend assemblies, contact Shakespeare. Layers of innovation and triple UV protection for long lasting durability. The benefits of Shakespeare composites are equally compelling for the deadend assemblies, which serve as the anchoring points along transmission and distribution lines. Engineered for robust performance, oftentimes, a single Shakespeare composite deadend structure can replace two wooden structures at each deadend point. In short, at less than half the weight of wood, a single composite structure can provide greater strength and durability than two wood beams. As utilities seek to improve system resiliency and maximize uptime through storms, droughts, and repeated freezes and thaws, Shakespeare composite tangent crossarms and composite deadend assemblies provide proven strength and durability and are essential components of a hearty, robust grid. The new Shakespeare braceless alley arms are specially engineered crossarms, which in the field, are mounted to only one side of a utility pole. With exceptional strength and durability, our alley arms are ideal for use in applications where space and easements are restricted. The braceless design, a first for composite crossarms, frees up vertical space on the pole, allowing for additional clearance. Download the new Shakespeare Braceless Alley Arms product sheet to learn more. As a pioneer in developing composite products for the utility industry, no one can match Shakespeare’s know-how and industry leadership. Shakespeare listens carefully to customer feedback and responds with crossarm products that meet or exceed utility specifications and expectations from across North America and beyond. Shakespeare’s growing customer base appreciates the many advantages Shakespeare composite tangent crossarms and composite deadend assemblies provide over wood and other materials. Long-life durability – Shakespeare crossarms will not splinter and rot like wood, nor rust like metal. Unlike wood, composites are impervious to insects, woodpeckers, and weather. The specified strength factors remain intact over the product lifespan. Further, Shakespeare composite structures are impact resistant for easy transport in the field. Deflection mitigation – Shakespeare provides the best selection for load vs. deflection considerations by offering multiple crossarm profiles to ensure low deflection rates. The engineered deflection-mitigation characteristics yield a desirable side benefit, in that the crossarms are often crafted to be stronger than necessary in order to address deflection. Lightweight design – Easy to transport, lift and install, Shakespeare composite structures can be hand carried into hard-to-reach locations. Ease of installation – With a high-density, closed-cell foam fill that locks out moisture and contaminants, Shakespeare crossarms can easily be field drilled along the entire length of the crossarm using standard installation equipment. Further, Shakespeare can pre-drill crossarms to specified settings at the factory for your convenience. UV protection – Shakespeare provides triple protection from ambient ultraviolet exposure. First, during the pultrusion production process, 100% of the glass fiber strands and fiberglass mat components are saturated with UV-inhibitor-laden resins. Second, these materials are then covered with a UV-polyester-veil barrier. Third, after pultrusion, the crossarm is coated with a high-performance urethane finish. Safe – Shakespeare composite structures are strong, yet remarkably light in weight compared to wood or steel. This inherent advantage may help alleviate possible injury to linemen, warehouse, and other utility personnel. Low maintenance – Shakespeare’s 100% maintenance free construction saves time and money over the product lifetime. Shakespeare non-corroding composites will not deteriorate in salt-air climates, desert heat or acid rain. Regardless of humidity, they will not rust, ever, and they easily withstand harsh, industrial environments. Environmentally sound – Unlike treated wood, Shakespeare composite crossarms need no harmful chemical preservatives to protect them from decay or insects, plus are well suited for environmentally sensitive areas where heavy equipment may damage sensitive land. Attractive – Choose a grey or dark bronze color. Custom colors are available upon request. The urethane coating provides excellent protection and color retention when exposed to the sun and environmental contaminants. Accelerated testing confirms, the 3-stage UV protection will consistently resist weathering and maintain its strength in excess of 40 years. Unlike wood, Shakespeare tangent crossarms and dead-end assemblies are free from knots and imperfections that can cause failure over time. In fact, Shakespeare crossarms consistently withstand transient loads that cause wooden beams to fail. Shakespeare manages an extensive tangent crossarm testing program, which includes industry-standard beam testing. Our crossarms also undergo advanced, Tangent Eccentric Load Testing. These tests result in data that are valid for the whole system, including the mounting hardware and the brackets, not just the crossarm, a far better indicator of real-world performance. Shakespeare tangent crossarms are engineered products, created on highly-sophisticated, computer-controlled pultrusion equipment for precise consistency and exacting quality control. Pultrusion is a continuous process for manufacturing composite materials with a constant cross-section. Shakespeare integrates a continuous roll of high-quality, reinforced fiberglass strands with a high-strength fiberglass mat, which adds multi-directional reinforcement and resilience when combined with the fiberglass filaments. These components are integrated and saturated in a liquid resin mixture, prior to being pulled through a heated, steel forming die using a continuing pulling device, (hence the term, pultrusion). The output is a rigid, fiberglass-reinforced composite structure that will never rot like wood. A new crossarm innovation from Shakespeare, the Matrix™ Insert, provides Improved torque performance and unprecedented crush resistance for insulator angle turns and field drilling. The Matrix insert is now provided in all S-Series crossarms and may be available upon request for profiles and assemblies. Download the new Matrix Crossarm Insert product sheet to learn more. The Matrix Insert is foamed into place within the crossarm interior. Shakespeare's high-density, closed-cell foam prevents moisture ingress for a long performance life. This center core provides strength to the overall profile by supporting the shape of the product when a load is applied. Users can easily field drill the crossarm without using additional inserts. Shakespeare also produces superb crossarms and braces for high-voltage transmission pole applications. These Shakespeare composite innovations provide the same benefits as our distribution crossarm products. Learn more about Shakespeare H-Frame crossarms and H-Frame braces. Shakespeare takes a systematic approach to UV protection, and formulates UV inhibitors into the liquid resin mixture from the beginning of the production process. Our crossarm outer shell then is covered with a tightly woven fiberglass veil that is saturated with a UV-inhibitor. This veil provides a resin-rich crossarm surface than controls blooming. In post-production, the finished product receives an exterior coating of our high-performance, UV-protective urethane finish. Product performance is verified by extensive accelerated testing which demonstrate that Shakespeare crossarms can easily handle what nature dishes out - for decades. To provide superior crush-resistant strength, and to eliminate the risk of crushing the crossarm while installing hardware, Shakespeare injects a high-density, closed-cell urethane foam into the fiberglass shell. The finished product density ranges from 4-5 lb. per cubic foot density as standard. The advantages of this dense foam are numerous. The foam adheres to the walls of the outer fiberglass shell to produce an encapsulated composite structure. This is important to keep any possibility of water working its way into the structure. In electrical testing, the composite structure shows no evidence of water absorption whereas a wooden counterpart will show signs of absorption. Further, because the foam is infused throughout the structure, you have the ability to drill holes of any size or placement along the crossarm. Shakespeare pioneered the use of highly durable, impact-resistant end caps on composite crossarms. Our crossarm end caps are produced by an injection molding process. During production, these end caps are inserted into the crossarm and foamed into place. Our process ensures end caps will remain securely in place and not come off of the arm. Shakespeare crossarm and deadend assembly end caps are made of a thermoplastic that exhibits optimal flexibility during temperature extremes. The flexibility is also important because it helps protect the end of the crossarm during the shipping, storing and handling of the product. Shakespeare has decades of experience providing composite support structures for outdoor lighting and is a natural choice for providing arm supports for mounting outdoor lighting components on utility pole structures. Shakespeare can also provide crossarms to support surveillance cameras, antennas or emergency sirens. Further, Shakespeare offers mounting arms for equipment such as cutouts, arrestors, and cable terminators. To learn more about our composite tangent crossarms, composite deadend assemblies, or composite structures for any other utility application, contact Shakespeare.